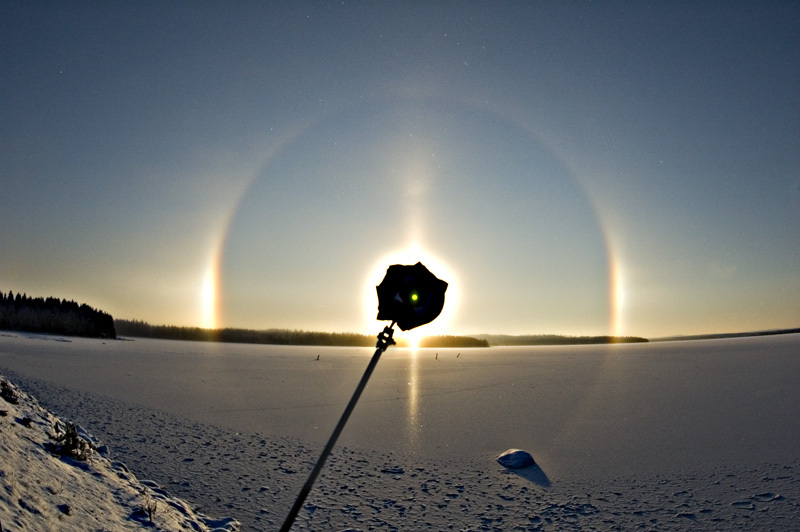 On the 17th November I drove 250 kilometers to the town of Sotkamo to check if there were any diamond dust halos. Two weeks earlier I had made the same trip, but the snowguns hadn't produced any halos. This time, however, the ski resort was surrounded by a thick fog cloud in which diffuse halos were visible. I started searching for a better spot and after a while of driving the cloud started thinning. 22º halo, parhelia and M-arc were present and I took ice crystal samples before continuing the search. Several kilometers later it started looking really good and I stopped the car by a field where the view was unobstructed. The parhelia were extremely strong, and I made my first observation of 44º parhelia. Other halos were 22º halo, sunpillar, subsun, subparhelia, upper tangent arc, circumzenith arc, 120º parhelia, 46º halo, parhelic circle and M-arc. 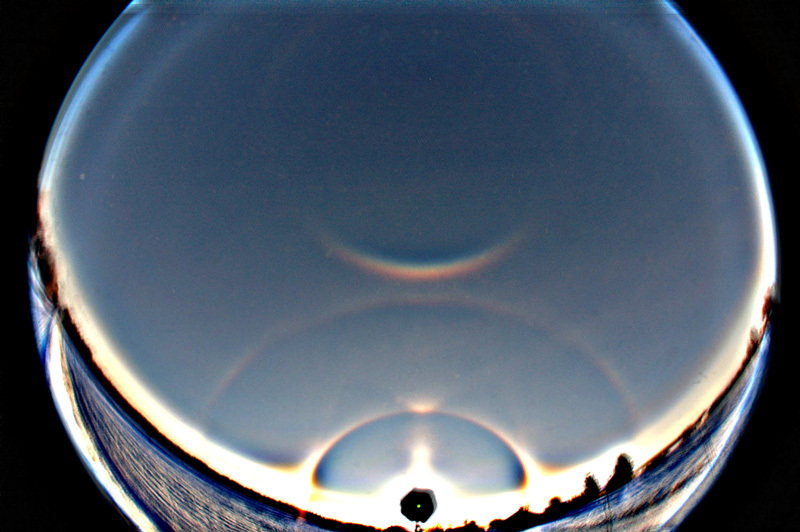 The 120º parhelia looked like fuzzy pillars. I took several hundred photos and ran out of memorycard. Luckily I had an old camera with slide film, but as it also ended pretty fast, the only solution was to get a new memorycard from the local town over 10 kilometers away. When I was back, the display was still going on, but the new card also got filled up in half an hour. So it was time to get home. Next day, as I was having a closer look at the photos I couldn't believe my eyes what appeared on the screen. The circumzenith arc had a faint extension going all around the zenith: the Kern arc. 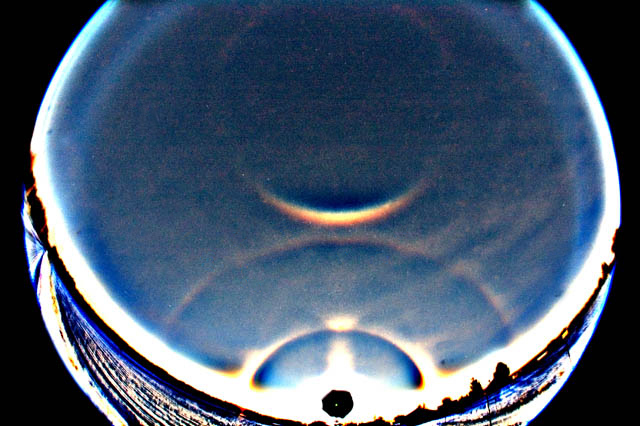 See this photo, which also shows reflected Lowitz arcs. In some of the photos the 46º halo has an angular appearance revealing the 46º contact arcs , which were first photographed in Muonio a year ago ( 1 - 2 ). Although readily appears in simulations, the Kern arc has been controversial because of the lack of photos. It was first reported by H.F.A Kern in 1895 in the Netherlands and at least six subsequent reports are known. As an explanation for Kern arc formation, raypath 1-3-5 in plate crystals as well as multiple scattering has been suggested. In the Sotkamo display there were 44º parhelia indicative of the latter, but it is not certain whether this mechanism is applicable higher up in the sky where the crystal cloud is optically much thinner. Single scattering raypath 1-3-5 produces Kern arc easily, especially when the crystals are towards triangular shape and the sun is low. Both of these circumstances were realized in the Sotkamo display where the sun elevation was six degrees and a considerable number of crystals were semitriangular. As for crystal aspect ratio, it is thick plates that are favourable for Kern arc formation. The crystals in the photos seem to be below optimum thickness, but it should be noted that the crystal samples were collected before the peak of the display when Kern arc was not yet occurring and thus the sample may not fully representative. During recent years we have seen photographs of numerous displays with very bright parhelia. It is probable that at least some of them involved the Kern arc. This might be worth keeping in mind when the next bright plate crystal display comes along. Magnificent work, congratulations !!! In my opinion this keeps us halo observers more and more motivated, in visual observing and also in halo photography. Who knows, when the next remarkable observation comes along. Well done ! Thank you for giving us such emotions! Congrats !!! You took the halo observing on the next level ! Congratulations Marko! 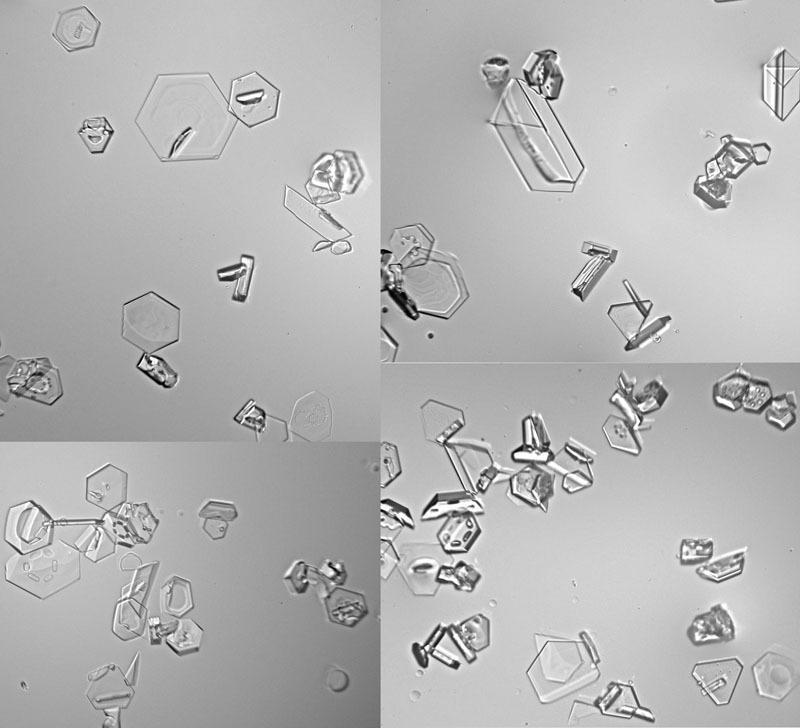 Only a dedicated halo observer like yourself could have obtained these images and crystal samples. Great catch, Marko! You've made history with these photos. Timo is right: this observation and your enthusiasm has given everyone even more motivation. Congratulations!! Highest possible achievement in halo observing, Mikkilä. When I got to know about this in November, I must admit, there was two days of grayness in my life. With these photos you reached immortality. This amazing November day will divide halo history into two eras - before and after.... Great job MiG! Congratulations! All the nicest words were written before me, but your example shows all the simple observers how to become profound observers in this magic field of halos! Thanks. Past two months has been quite intresting. Now its like huge relief to me. Will there ever be another pursuit of similar magnitude in the field of halo photography as getting a photograph of the Kern arc? I can still remember my astonishment when I first saw these remarkable images. I also still have the mobile phone camera image that Marko sent me from the field. Priceless! Hopefully we're headed towards other great photos and discoveries! Another word of advice, since those photos are very valuable marko I highly recommend that you put those on a disk because if your PC were to crash you could lose them. Once you got a copy made put the disk in something like a safe. Thanks of advice. I have several backups, and one DVD is in another location than my home. I have such pictures myself. You have pictures of kern arc? Intresting is it possible to see those photos? Karin, it would be important to see your Kern arc images. Can you provide a link? I went skiïng in Austria on jan. 2009. What I saw, was beautifull! A big halo, several (7?) suns and other stuff, which I couldn't mention then. But I knew it was special to see so much at once, and so bright and clear. I believe there was only 1 snow-gun on? I hope you all like my photo's, I wonder how interesting they are, but there sure interesting to me and to my holliday... Because the reality and the memoy of it is more beautifull than the pictures. 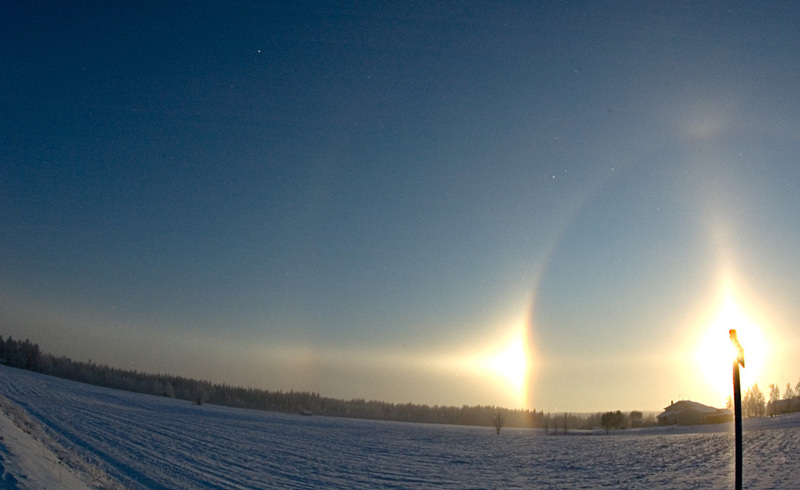 your photos show a magnificent display of ice crystal halos. 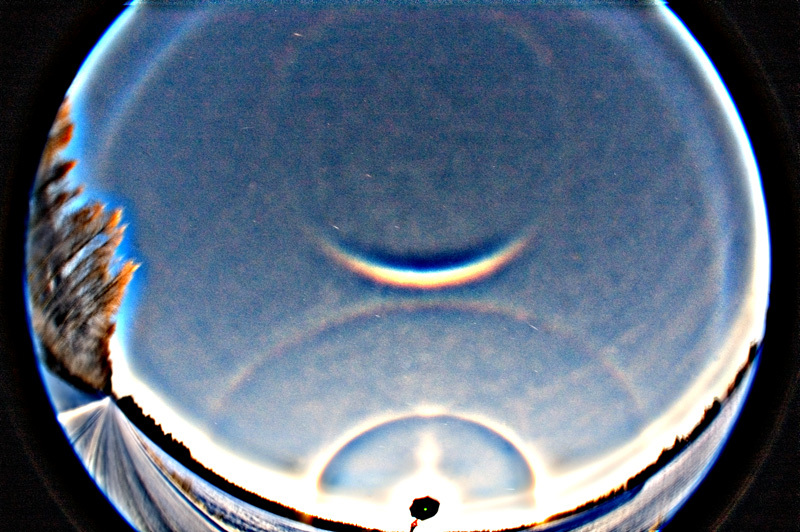 Typically the most interesting and rare haloforms are located in those parts of the sky which are outside of your photographs. 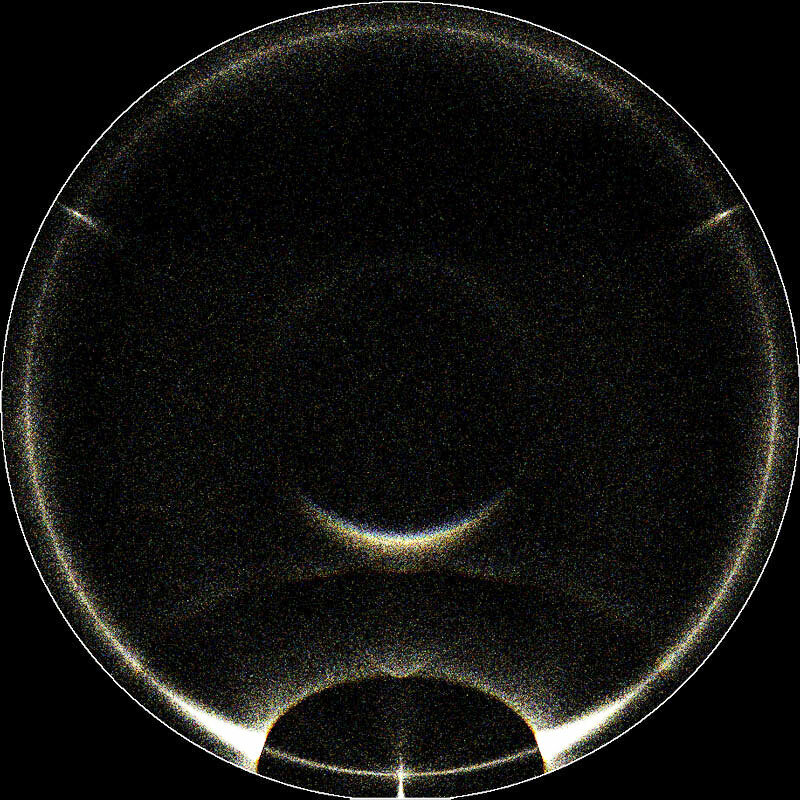 The rare halos are less spectacular in appearence, and thus are often left undocumented. Marko Mikkilä's photos from last winter show, among other interesting features, a previously unphotographed halo - Kern arc. This halo is the very faint haloarc at the very top of the photo included in this posting. 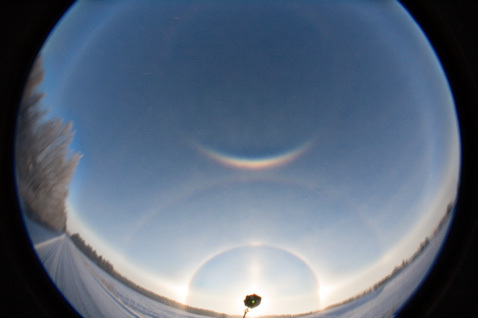 The Kern is a "continuation" of the most dominant halo form, the circumzenith arc, at the centre of the photo. Keep your camera available at least when you go skiing to the mountains! Such displays can, and will, occur again. So I'm the second one in the world with a Kern arc on a photograph? I do know that my photos are not as good as here on this site. But I do believe that all there was to be seen, is on my photographs. Now wat is the small thing between the Kern ard and the halo? And is it possible that there were 7 suns? One for real, 3 in the halo (left, right and bottom) en 3 in de moutains/clouds below. Or am I al little overenthousiastic now? Greetings from a Dutch lady who went skiïng in Austria, Karin. I am sorry but there is no Kern arc in your photos. The strong arc 46 degrees upwards from the Sun is circumzenith arc. It is very common phenomenon. In your photos it is very strong and beautiful, but by no means anything special. The Kern arc may have been in the sky, but your photos do not cover the area of the sky where Kern is located at. Please, take a look at Les Cowley's site. The other "Suns" are genuine halo forms, namely parhelia, subparhelia, subsun etc. Information of those halos can also be found from the site I mentioned above. The sharp arc between circumzenith arc and circular halo is Parry arc. Basic component in these displays. Oké, now I understand. I misunderstood the first message. Thanks for the explanations. And good luck on your hunts! Next time I know where to look en what to photograph!